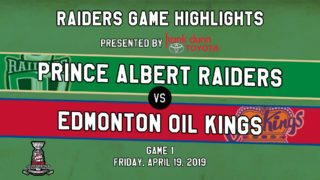 RAIDER REVIEW: The Raiders (26-1-0-1) open a home-and-home series with the Brandon Wheat Kings (14-7-3-3) tonight at Westoba Place. 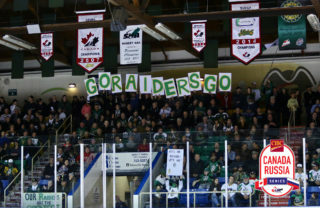 On Tuesday, the Raiders suffered just their second defeat of the season, falling 3-2 in a shootout to the Broncos in Swift Current. Joel Hofer was the star of the game, stopping 52 shots and all three Raiders in the shootout for the win. Brett Leason and Brayden Pachal were the goal scorers for the Raiders. Ian Scott made 21 saves in regulation and stopped two of three shooters in the shootout. VS. BRANDON: This is the second of a six-game season series between the Raiders and the Wheat Kings. In the first meeting of the year, Ian Scott made 26 saves in a 6-0 shutout of the Wheaties at Westoba Place. Four Raiders had multi-point efforts led by Sergei Sapego with three assists. STREAK IN REVIEW: The Raiders’ franchise record 19-game winning streak came to an end on Tuesday night. During the 1,140 minutes of game action from the 19 wins, the Raiders only trailed for 17 minutes and 36 seconds. If including Tuesday’s loss to Swift Current, there is an additional two minutes and 48 seconds trailing. Over that span, the Raiders averaged 5.1 goals per game and outscored opponents 97-31 in the process. Ten different Raiders tallied the game-winning goal, led by Brett Leason’s six winning markers. Ian Scott won 16 of the contests between the pipes, posting a 1.50 goals-against average, a 0.946 save percentage and four shutouts. 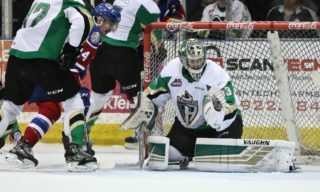 FILLING THE NET: Raiders captain Brayden Pachal is on an impressive offensive run as he is riding a career-long three-game goal streak. His goal on Tuesday night matched his career-high goal output of seven, which was set last season. The defenceman from Estevan has points in eight of his last nine games, scoring six goals and adding five assists. SHOOTOUT: Tuesday night was the first shootout of the season for the Raiders. Last season, the Raiders went to the shootout seven times and won three of them. Jordy Stallard, Parker Kelly, and Cole Fonstad tallied the winners in the victories. 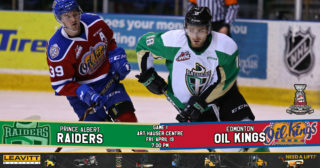 NEXT UP: The Raiders return to the Art Hauser Centre for the first time since Nov. 20 to close out the home-and-home series. Puck drop is 7 p.m. Limited tickets are available at the Raider Office.